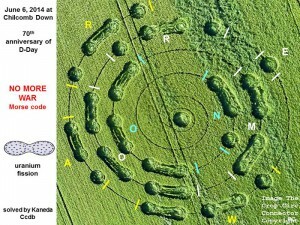 Shown below is a recent Crop Circle which was discovered on Gipsy Lane, Chilcomb Down, near Winchester, Hampshire, United Kingdom. Reported 6th June.The message, expressed in Morse Code (which this unquestionably represents) reads No More War. Crop Circles Research Foundation couldn’t agree more with this statement. What about the single “dot” in the center of the formation. As you can see, a single “dot” represents the letter “E”. Could this imply that this message is sent to us from “E”xtrterrestrials? 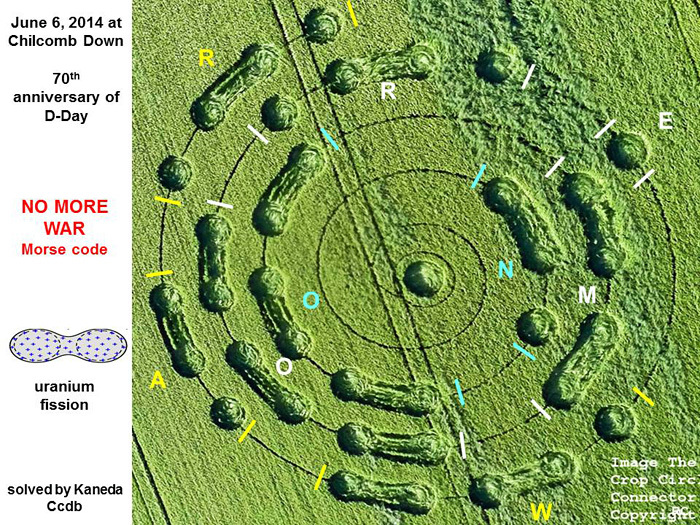 Thanks to Red Collie for the diagram, and thanks to Kaneda Ccdb for deciphering the meaning of this Crop Circle. Update July 17, 2014: This video is important, and I feel that this man is right on when he states that humanity is being instructed by the senders of this Crop Circle to stop having wars. Additionally, we must denounce war as a means to solving international disputes. Today, many children were killed in Israel’s ongoing genocide of the Palestinians. A Malaysian airliner was shot out of the air by an as yet unknown group. World tensions seem to be escalating toward what could become a major World War. The statement says what it says: “No More War”. In my opinion, the human race had better heed this advice / WARNING. My U.S. tax dollars are assisting Israel’s effort to exterminate the Palestinians, and I state here that I am extremely distressed by this fact.